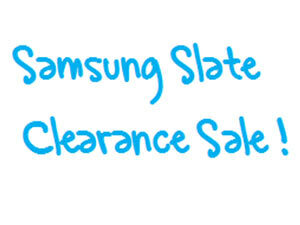 Samsung and Tablet PC are announcing a massive slate clearance sale across Tablet PC ‘slate’ models while stocks last. To find out if these Tablet PC are going to be the right hardware device for you please call Tablet PC on 1300 110 101. To place an order, please email info@tabletpc.com.au or call us on 1300 110 101. These models are not available through our Tablet PC Store, only by calling us on 1300 110 101. Further discounts are available to volume purchases of 10+ units on a single order. Samsung ATIV Smart PC XE500T1C-AE1AU – Intel Atom Z2760 1.5GHz CPU – 11.6″ Touch Screen – 2GB DDR3 RAM – 64GB eMMC – Intel HD Graphics – Windows 8 32Bit – S Pen & Dockable Keyboard – 3 Years Return To Base Warranty – RRP is $1,249 inc. GST – Tablet PC price is $749 inc. GST with free delivery, and Tablet PC email and phone technical support. Samsung ATIV Smart PC 7 XE700T1C-AE1AU – Intel Core i5-3317U 1.70 GHz – 11.6″ Touch Screen – 4GB DDR3 RAM – 128GB SSD – Intel HD Graphics – Windows 8 – S Pen & Dockable Keyboard – 3 Years Warranty – RRP is $1,599 inc. GST – Tablet PC price is $1,049 inc. GST with free delivery, and Tablet PC email and phone technical support. 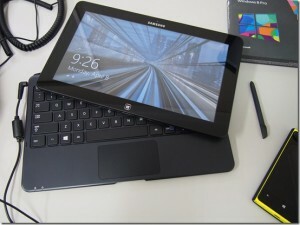 Samsung ATIV Tab XE700T1C-AB1AU Slate PC – Intel Core i5-3317U 1.7GHz CPU – 11.6″ FHD Touch Screen – 4GB DDR3 RAM – 64GB SSD – Intel HD Graphics – Windows 8 Professional 64Bit – S Pen & Dockable Keyboard – 3 Years Return To Base Warranty – RRP is $1,699 inc. GST – Tablet PC price is $1,282 inc. GST with free delivery, and Tablet PC email and phone technical support. Samsung ATIV Tab XE700T1C-HB1AU Slate PC – Intel Core i5-3317U 1.7GHz CPU – 11.6″ FHD Touch Screen – 4GB DDR3 RAM – 256GB SSD – Intel HD Graphics – Windows 8 Professional 64Bit – Telstra Certified 3G – S Pen & Dockable Keyboard – 3 Years Return To Base Warranty – RRP is $2,249 inc. GST – Tablet PC price is $2,044 inc. GST with free delivery, and Tablet PC email and phone technical support. Samsung ATIV Tab – XE700T1C-MS1AU Slate PC – Intel Core i5-3427U – 11.6″ FHD Touch Screen, 4GB DDR3 RAM- 128GB SSD – Intel HD Graphics – Windows 8 Professional – S Pen & Dockable Keyboard – 3 Years Return To Base Warranty – RRP is $1,899 inc. GST – Tablet PC price is $1,399 inc. GST with free delivery, and Tablet PC email and phone technical support. Samsung ATIV Tab 5 – XE500T1C-G01AU – Intel Atom Z2760 (1.5Ghz) – 11.6” FHD Touch Screen – 2GB DDR3 RAM – 64GB SSD – Telstra Certified 3G – Intel HD Graphics – Windows 8 Professional – S Pen & Dockable Keyboard – 1 Year Return To Base Warranty – RRP is $1,299 inc. GST – Tablet PC price is $997 inc. GST with free delivery, and Tablet PC email and phone technical support. Samsung ATIV Tab 5 – XE500T1C-G01AU – Intel Core i5-3317U 1.7GHz CPU – 11.6” FHD Touch Screen – 4GB DDR3 RAM – 128GB SSD – Telstra Certified 3G – Intel HD Graphics – Windows 8 Professional – S Pen & Dockable Keyboard – 1 Year Return To Base Warranty – RRP is $1,899 inc. GST – Tablet PC price is $1,705 inc. GST with free delivery, and Tablet PC email and phone technical support.